The Qianling Mausoleum Management Office on Thursday repudiated a wide spreading rumor that the government was considering the large scale excavation of Empress Wu Zetian's tomb, saying it was "sheer fiction," Huashang Daily reported. Chen Yande, vice director of the office, told the newspaper that the excavation of the tomb will not be put on the agenda within at least the next 50 years. Previous reports originated from a weekly publication said the time was ripe to open up the tomb rooms since archeologists have accurately detected their locations. They suggested the possibly broken ancient structures and relics were in urgent need of repairs. The reports said the government could also use the opportunity to develop the vast western region and boost the province's local tourism by attracting additional 5 million visitors every year. "The bureau did invite the Tsinghua University in 2011 to design a 20-year plan of the scenic spot development, and the plan has initially passed the appraisal of experts," Chen said. "But some people might probably have quoted [that information] out of context and misunderstood." Zhao Rong, director of the provincial cultural relics protection bureau, was doing research at the tomb site Wednesday. He clarified the report by saying "the current top priority task of the bureau is to preserve the integrity of the tomb site and maintaining the environment of surrounding areas." Qianling Mausoleum Museum Chairman Fan Yingfeng added that the museum had never discussed the excavation of the tomb with departments of cultural relics. 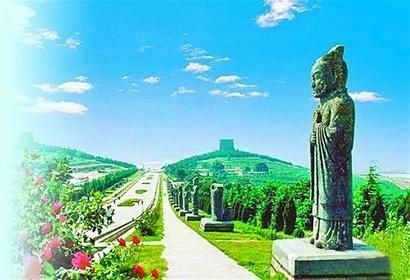 Built in the year 684 and sitting 80 kilometers northwest of Xi'an, Shaanxi Province, Qianling is the tomb of both Emperor Li Zhi of the Tang Dynasty (618-907) and his wife Wu Zetian, the only empress in Chinese history who reigned for 50 years. Qianling is the only ancient tomb in China that contains the remains of multiple emperors. In the past 1,200-odd years, there were numerous attempted robberies of the tomb, including 17 large-scale ones, which all reportedly ended in failure and thus added an air of mystery to the still-intact Tang Dynasty tomb. Qianling was listed as one of the historical relics under state-level protection in 1961. Applications to open up the tomb have never been approved by the Chinese government.